Do you own a hot tub? If you do, you’ll know that even the best hot tubs need to be sanitized and kept clean. Often many hot tubs will have a buildup of mold, algae or other unsanitary contaminants in the water due to overuse or improper cleaning. By incorporating a hot tub chemical system in to your hot tub maintenance routine, you are guaranteed to have a positive hot tub experience. With a variety of types and brands of hot tub sanitation products, it can be confusing deciding which one will do the job. The best hot tub sanitizer will keep your water clean, clear, and bacteria free. For your convenience, we’ve done the hard work for you and found 8 of the best hot tub sanitizers on the market. 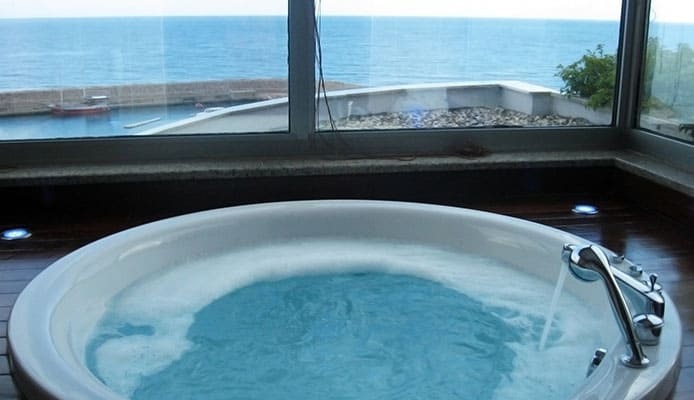 With one of these top picks, you are guaranteed to find the best hot tub sanitizer for you! For a natural hot tub sanitizer, Hot Spring offers the best solution to kill bacteria in your water and sanitize your hot tub. 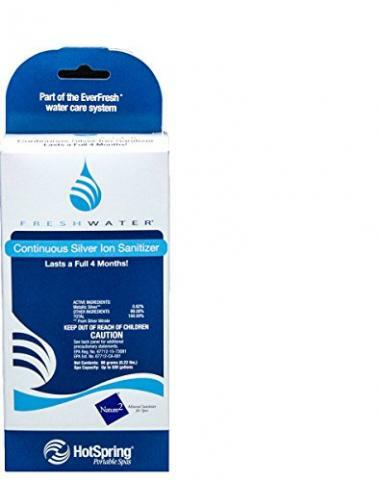 The Freshwater Silver Ion Sanitizer is a continuous hot tub sanitizer that uses the natural element of silver to clean your water. This hot tub sanitizer is safe for any hot tub, including inflatable hot tubs. It is easy to install and replace, which makes it the perfect hassle-free design for hot tub maintenance. Hot Spring’s hot tub sanitizer is affordable for everyone. SPA offers another approach to mineral spa care with their top rated Spa Frog Mineral Sanitizer. This hot tub sanitation device draws water in through openings in the cap and scooped louvers in the top. It then circulates SPA’s special mineral formula through the bottom for up to 4 months. It is easy to use because it fits directly in the filter of your hot tub. The Spa Frog also has an easy reminder dial to help you to remember when to replace it. Are you looking for hassle-free hot tub maintenance? We have the right solution for you. Nature2’s design is a Mineral Stick Purifier that works directly with your hot tub’s existing filtration system to provide clean and fresh water. It can clean large spas, like LifeSmart hot tubs; up to 500 gallons. It is free from any harsh chemicals and one cartridge will clean for about 4 months. Mineral sanitization is popular because of its generation of low chemicals, but not all designs are as versatile as HaRuion’s. The Power of Minerals Sanitizer Stick can be safely used in the home, hotels, swimming pools, and Whirlpool tubs. It will truly clean any and all water in a hot tub or spa. It is EPA-recognized and eco-friendly. 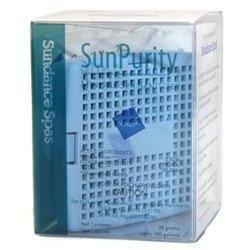 It uses no harsh chemicals, which reduces skin irritation. Minerals are safe and reliable and with HaRuion, you’ll have a hassle-free time cleaning your hot tub. 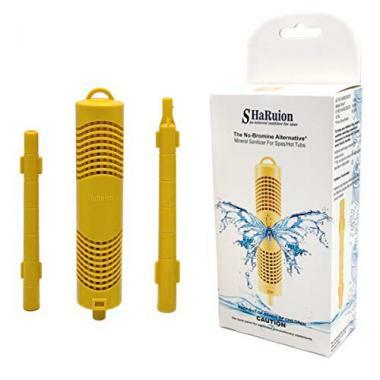 For exceptionally clean water, choose the top rated brand HaRuion. Sundance Spas has a great design that uses a natural process to carry out three important functions: disinfect, prevent algae, and provide clarity to your hot tub water. The SpaPurity has a cartridge design that makes your water crystal clear. It is free from unpleasant odors and won’t leave any residue lines. It can easily be incorporated into your hot tub’s ozone system. It is safe for use in all designs, including Intex hot tubs. However, it should not be used with bromine or biguanides. 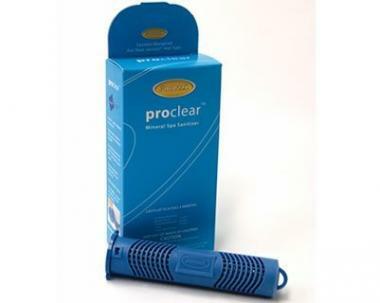 Clean, easy, and hassle-free maintenance is easily achieved with Jacuzzi’s ProClear Mineral Spa Sanitizer. This hot tub sanitizer works with the existing filtration system and can be dropped directly into the filter. It has a Controlled Release Technology (CRT), which lasts for 4 months, to ensure that there are always optimal mineral levels and no staining. It would work great with Bestway hot tubs and will leave water softer and clearer. Nature2 is a popular brand because it is reliable and trusted. Their Spa Stick is a real alternative to a traditional chlorine or bromine hot tub chemical system. 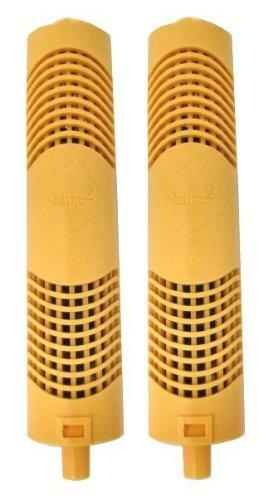 Nature2 uses a patented mineral bed technology to clean and maintain a healthy spa. The Spa Sticks’ formula will improve the look, feel, and smell of your spa water without the need of harsh sanitizing chemicals. 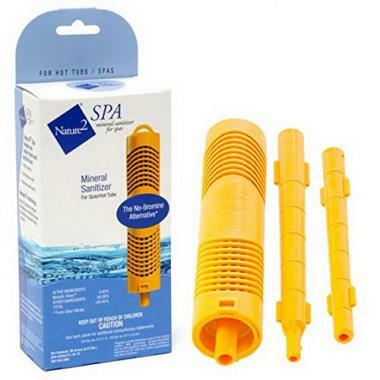 To use the Nature2 Spa Stick, you simply drop the cartridge directly into the hot tub’s filter and you’re done! Maintenance is vastly simplified, which means you can spend more time using and relaxing in your hot tub instead of looking after it. One cartridge can last up to 4 months and it is safe for designs like Coleman hot tubs. Completing our list of the top eight choices is a design by Caldera Spas. 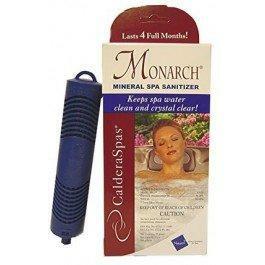 The Monarch Mineral Spa Sanitizer uses silver ions to naturally clean and kill bacteria in your hot tub, jacuzzi, or spa. The silver has a natural chemical reaction that sanitizes your spa, without the need of harsh chemicals like chlorine or bromine. Caldera Spas’ design is safe for all models of hot tubs and spas, including wood fired hot tubs. It will quickly become a regular and important staple in your hot tub maintenance routine. The cartridge is easy to install and quick to replace, so you have a hassle-free time caring for your hot tub. With this sanitizer, you have an easy and affordable solution to hot tub maintenance. When looking for a hot tub sanitizer one of the first things you will have to consider is which cleaning chemical to use. There are a variety of spa sanitizing cleaning agents that all have a different chemical base. Once you have decided which chemical base to use, you can then consider the features you need and want. It can also help to read hot tub sanitizer reviews to see what other hot tub owners think of a specific hot tub sanitizer. A top rated spa sanitizer will be compatible for your hot tub and make maintaining your hot tub easier. Not all hot tub sanitation solutions have the same chemical base. There are a variety of chemical available that will properly clean a hot tub. The most commonly used chemicals are chlorine, salt water, bromine, and minerals. Chlorine is the most popular choice for a hot tub chemical system because it is trusted and reliable. You may even remember the strong smell because of its wide use in pools, hot tubs, and spa throughout the world. Chlorine is very safe, and it is affordable. It comes in different forms like liquid, tablet, and powder solutions. Salt water is a way to naturally create your own chlorine sanitizer. The salt will be converted into low levels of chlorine and it won’t give off a strong smell. Salt water is naturally very clean and an excellent choice for anyone with sensitive skin. Bromine can be used just as effectively as chlorine if you hot tub is kept out of direct sunlight. This alternative to chlorine is odorless, but effective in eliminating bacteria. It can tolerate pH fluctuations, which makes it easier to work with. Minerals are becoming a popular natural sanitizer to kill bacteria in the water. The only downside is that it is slow acting and may need a boost of chlorine or a weekly hot tub shock to keep your water clean. The size of your hot tub and how much water it holds will affect how much sanitizer you need to put in. The more water means more chemicals need to be added. This also means that the larger your hot tub, the more money you will have to spend. A sanitizer for hot tubs is only one part of the maintenance routine needed to keep the water clean. You will have to test the hot tub water to ensure that all the chemicals are properly balanced. The pH balance is also important and will need to be compatible with all the added chemicals too. If you change your hot tub water, you will also need to add all the chemicals again, so that the fresh water stays clean. Ultimately, hot tubs are expensive but there are many top rated spa sanitizers that are affordable too. How long your hot tub chemical system lasts will be depending on how well your hot tub is balanced. 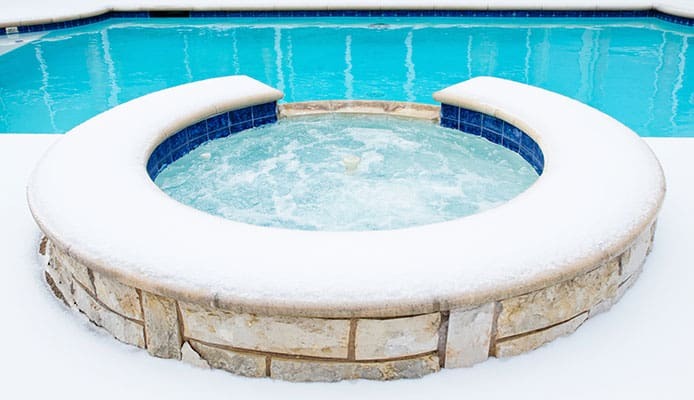 Most hot tub sanitation will need to be tested weekly and depending on the use throughout the week, more chemicals may or may not need to be added. Hot tubs are expensive, and the cost doesn’t end with the initial purchase. The cost of maintenance adds up, which makes an affordable sanitizer for hot tubs the best choice. Many hot tub sanitation solutions are affordable, but some are less than others. Most people want to use the same sanitizer, once they have found one that works for their hot tub chemical system, so it is important to consider your budget. Finding the best spa sanitizer for your needs also means that it is affordable. The best hot tub sanitizers come in a variety of types. The chemicals may come in forms of liquid, tablets, or powder. The type you choose will likely be up to your personal preference and hot tub. Any top rated spa sanitizer will work to kill bacteria in your water, regardless of what type or form it comes in. Q: What is a hot tub sanitizer? A: A hot tub sanitizer is a disinfecting chemical solution that will clean the water by killing any bacteria or contaminants. Hot tub sanitation is an important part of owning and maintaining a hot tub. The best hot tub sanitizer can be used safely alongside other hot tub chemicals to create the perfect spa experience. It will be easily incorporated into the water and the levels can be checked using pool test strips. Q: Why do I need a hot tub sanitizer? A: You need a hot tub sanitizer to promote a positive, safe, and healthy spa experience. Hot tubs are meant to be used by a variety of people and all the different bacteria on the skin, eventually end up in the water. Great hot tub hygiene using a hot tub sanitizer to eliminate the bacteria and contaminants that are not natural to a hot tub’s environment. If you own a hot tub, a hot tub sanitizer is a necessity to have clean water. Q: What are different hot tub sanitizing methods? A: Two alternate hot tub sanitizing methods are using ultraviolet light and ionizers. Ultraviolet light or UV light uses a safe form of radiation to kill germs and bacteria. It is great at killing organisms, but it can’t keep your water clear. You would likely have to use hot tub defoamers alongside it. But UV is an effective alternative method that some owners prefer because of its great ability to kill the microscopic contaminants. Another method is to use ionizers. Ionizer are another natural method to kill contaminants in the water. An ionizer will work to release small copper and silver ions in the water, which then have a natural chemical reaction. 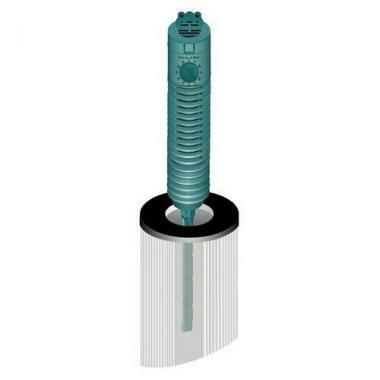 Similar to UV, the ionizers will shock the system and maintain a hygienic environment. However, keep in mind that ionizers have a shelf life and will need to be replaced on the expiration date and based on the usage or number of bacteria in the water. You should also remember that the two types of hot tub sanitizing dispensing methods are manually and automatically. You can automatically add your hot tub sanitizer to the water, alongside your other chemicals in your maintenance routine. Or you can look for a hot tub sanitation device that will administer a chemical agent slowly over time. The most common method to use is manual because this allows you to constantly check and balance your chemicals. However, a popular automatic hot tub sanitizing method is using a mineral sanitizer, which will be in a tube that floats in the water and dispenses over time. Mineral sanitizers are an automatic sanitization method that often work in tandem with your hot tub’s filtration system to push elements like silver and copper ions into the water to disinfect it. A hot tub sanitizer is very important to the health and safety of your hot tub. With the best hot tub sanitizer, you will have a clean and positive spa experience. You should be certain that your hot tub sanitizer works for you and shouldn’t be afraid to test out a few different brands until you find the perfect one. It is important that you love your hot tub sanitizer because it can make maintenance a breeze. Do you use one of the hot tub sanitizers that made it onto our list? Let us know how it has worked for your hot tub maintenance needs in the comments section below.